Tested it, so far the fan now turns off during filming, a lot better… but the slight delay in sound sync (About 2 frames) has not yet been verified by myself, though they say its been fixed. Consumption reduced, increasing Osmo battery life to 90 minutes for a total recording time of 70 minutes (80 minutes with Wi-Fi off). Fan turns off automatically when recording video. To keep fan off during video recording, tap Mute Fan in the Audio Control menu. When activated, the fan will only restart to prevent critical overheating. Video downlink optimized for enhanced live streaming. Added Digital Zoom Control when recording video at 720p, 1080p and 2.7K. Put two fingers on the screen and pinch to zoom out, open your fingers to zoom in, or switch on Digital Zoom Control for fine control. Control of Osmo tilt and pan axis simultaneously added by setting the joystick control direction to Free. Fixed a problem of audio and video not being synchronized on some devices. Added Portrait option to optimize portrait photography. Optimized D-Log and D-Cinelike colors. Downloading of videos and photos to mobile devices now three times faster. Continuous photo capture by holding down shutter button added. Added a key combination to turn on/off the Osmo’s Wi-Fi. Press and hold the trigger, then pull down the powerswitch, then release both power switch and trigger. Wi-Fi is off when the system status LED blinks twice. Repeat to turn on Wi-Fi. The Osmo will operate for longer when taking timelapse photos without Wi-Fi. Note appears DJIGO when trying to connection Oslo that is already connected to another mobile device. DJIGO now displays the current photo instead of alive preview when shooting timelapses. Audio control optimized to avoid audio distortion when recording in noisy environments. Double capture of the same shot when shooting panorama fixed. Horizontal calibration data saves automatically after powering off. Single video recordings in high temperatures are capped at 30 minutes to ensure video quality. 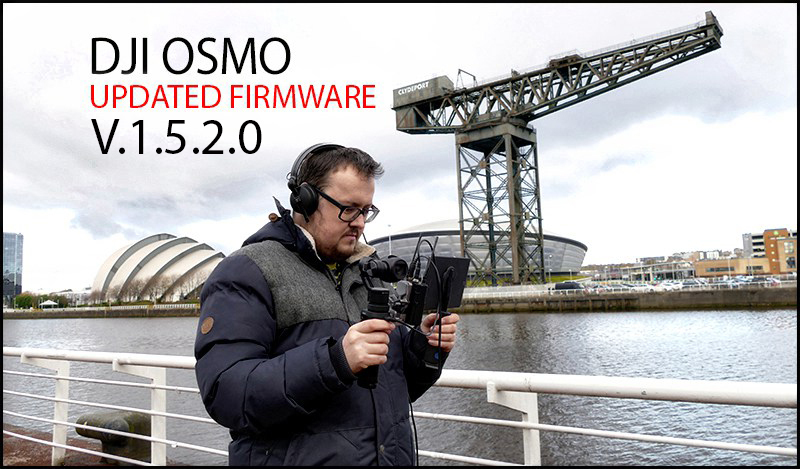 If firmware upgrade fails, restart Osmo and DJI GO app and retry. After update, auto calibrate the gimbal. If DJI GO on Android fails to display the firmware version after upgrade, restart it and connect your mobiledevice to the Internet before reconnecting to the Osmo.